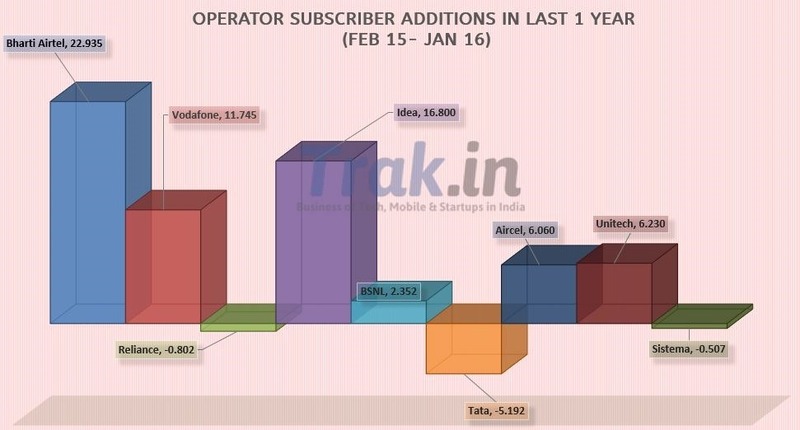 The new year started on a good note as far as new mobile subscriber additions is concerned. According to Jan-2016 telecom report by TRAI, 7.08 million new mobile subscribers were added in January, taking the total mobile subscriber base to 1017.97 million. India is currently the country with fastest mobile subscriber growth – In 2015 India added over 67 million subscribers, whereas in China mobile subscriber growth was closer to 30 million. As far as wireline subscribers go, they have seen a continuous fall since mobile revolution started around a decade back. There has not been a single month when wireline subscribers have increased over that period. Active subscriber base has seen continuous improvement over past 3 years. In 2012-13, the active subscriber base percentage in India hovered around 75 percent. However, due to various steps taken by TRAI, millions of inactive subscribers have been weeded out of the system. Currently, the active subscriber percentage stands at 90.14 percent, which is marginally lower than previous month. 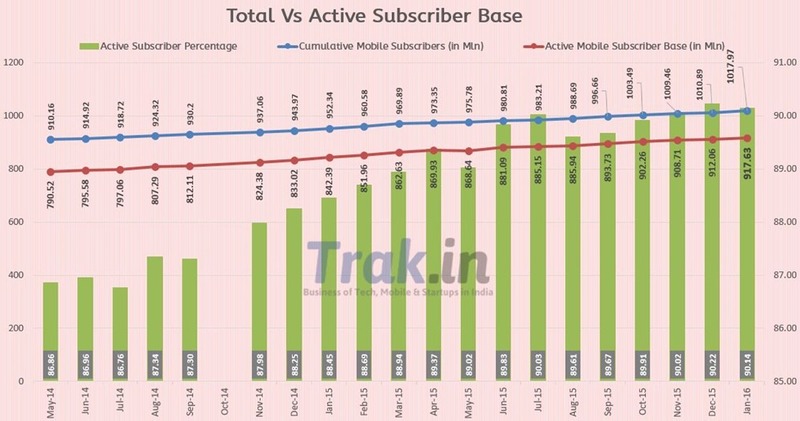 India has 917.63 million active subscribers currently – Here is how active subscriber percentage has growth over past 18 months. – With an increase of 7.08 mln in Jan 2016, total mobile subscriber base has reached 1017.97 million. India had 1010.89 million subscribers by end of December 2015. – Urban India witnessed a monthly growth rate of 0.57 percent or 3.28 mln subscribers, while rural mobile subscriber base increased by 0.88 percent or 3.80 mln. – Urban India has a total of 582.95 million, while rural India has a total of 435.02 million mobile subscribers. – Urban Teledensity increased to 147.72 from 147.12 in Dec 15, while the rural tele-density increased to 49.83 from previous 49.43. – Urban mobile subscriber share stands at 57.27% as compared 42.73% of rural subscribers. – 5.62 million new Mobile portability requests were made in month of Jan 2016, taking the total tally of MNP requests since launch to 199.62 mln. – Active Mobile Subscriber base increased from 912.06 million in Dec 2015 to 917.63 million in Jan 2016, taking the active percentage to 90.14 percent. – Total Broadband (> 512 Kbps) subscription numbers increased from 136.53 Million at the end of Dec- 15 to 140.10 million at the end of Jan-16 with a monthly growth rate of 2.62%. – Out of 140.10 million broadband users, 122.98 million access internet through mobile devices or dongles. Bharti Airtel added topped the charts adding 2.5 million subscribers in Jan. Idea Cellular added 1.25 mln followed by Vodafone who added 1.11 mln. The top 3 operators accounted for over 65 percent of total additions in January. Tata has had tough last couple of years. At the peak they had double digit market share in India – however, for the first time their market share has dropped below 6 percent. Among other operators, Telewings has been performing exceptionally well and now have reached a market share of just over 5 percent. 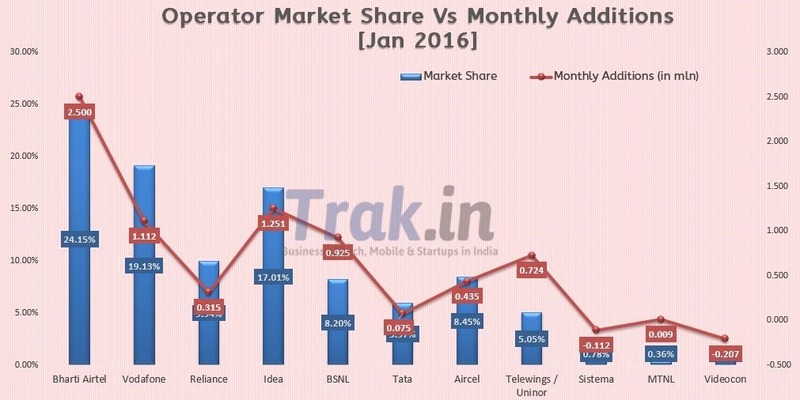 Here is a graph that shows Operator Market share and monthly additions for Jan 2016. Bharti Airtel remained clear winner with close to 23 mln additions in last 1 year. Idea Cellular (16.8 mln) came in second followed by Vodafone (11.75). Tata fared worst as they lost over 5 mln user base. "India Telecom Stats: 7M New Mobile Subscribers Added in Jan-16, Tele-Density Crosses 80%", 5 out of 5 based on 3 ratings.